Find out more about EATtheENEMY here. Which OSU are we talking about this week: Ohio, Oklahoma, or Oregon? 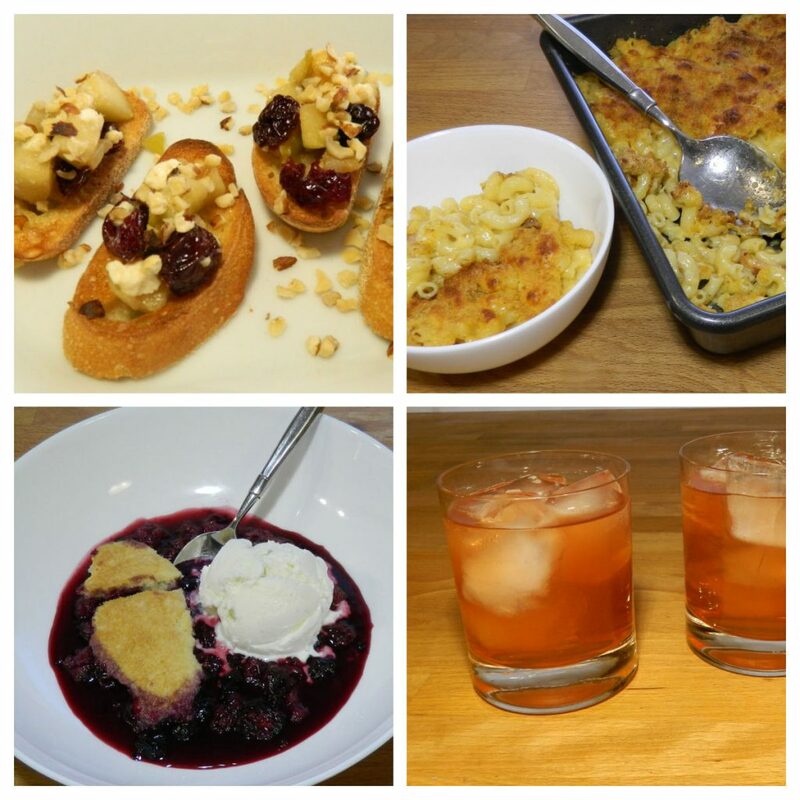 These recipes burst with local, fall flavors: berries, cherries, cheeses, hazelnuts. For the Northwest Bruschetta, sweet onion is sauteed in olive oil, mixed with tangy blue cheese, cherries, and apple, and topped with crunchy hazelnuts. Did you know that over 95% of all US hazelnuts are grown in Oregon? Tillamook means “Land of Many Waters,” and is also the name of a Native American tribe of skilled basket-weavers from coastal Oregon. Just this summer, Tillamook Cheese opened their newly remodeled creamery, where visitors can see their process, sample some cheeses, and pick up souvenirs. Cheese curds, anyone? (Wait, isn’t that just a weird Wisconsin cheesehead thing???) For our EATtheENEMY Tillamook White Cheddar and Bacon Mac & Cheese recipe, we had to use the yellow cheddar available in our local grocery store instead of white, but the result was still an incredible blend of flavors. And while we could have had birthday cake in honor of Oregon State’s 150th, we chose Oregon Berry Cobbler instead. The Willamette Valley’s fertile soil and marine climate give it a reputation as the blackberry and black raspberry capital of the world–and the center of Oregon’s wine production with over 500 wineries. Don’t forget to add some vanilla ice cream to this delicious berry cobbler! Oregon State’s first mascot was “Jimmy the Coyote,” but after 17 years, he morphed into Benny Beaver in 1910. We found quite a few beaver-inspired cocktails recommended by some Beaver fans. After some serious testing and tasting (hic! ), we settled on the Wild Beaver. The combination of whiskey, amaretto, and cranberry juice really hits the spot! Kettle Brand chips are made in Salem, Oregon. This 2017 Epicurious article ranked their 24 flavors–you’ll be surprised which came out on top.